As you might expect, I love all kinds of barbecue. I also love Asian food, but I'd never done any Korean barbecue, so this was a bit new to me. It's only a bit new because it uses a lot of familiar flavors, but to a different end. The Korean name of this dish is Daeji Bulgogi. 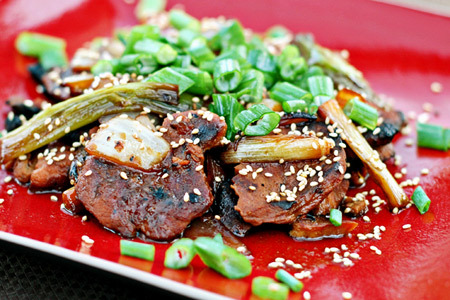 Bulgogi means "meat fire" and it's traditionally made with beef. In this case we add daeji, which means "pork", so we end up with "pork meat fire". Now, in barbecue terms that's just about all you need to know. This is a mildly sweet and spicy dish that is served with either lettuce for wraps, or with steamed rice. It also typically calls for pureed or grated Asian pear (a natural meat tenderizer), but I came up with a substitute of applesauce and pineapple juice. OK, enough with the food anthropology, let's get some pork meat fire workin'! Note: You'll need a grill wok or a wire rack to sit on top of your grill grate. You can also stir-fry this in a wok or cast iron skillet on the stove top. To aid in slicing, put the pork in the freezer for about 30-45 minutes. Combine all of the marinade ingredients in a large bowl and whisk well. When the pork is partially frozen, slice it across the grain to about a quarter inch. 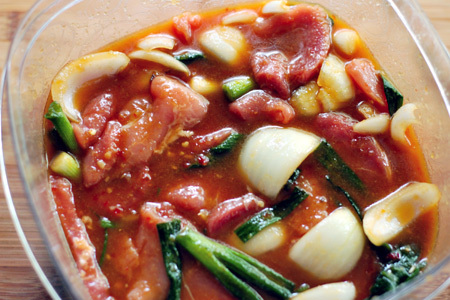 Add the pork, onions and quartered scallions to the bowl and stir to combine. Cover the bowl and marinate in the refrigerator for 3-6 hours. Start your grill and prepare for direct cooking at medium-high heat (350-375º). While your grill is heating, with a slotted spoon remove the pork, onions and scallions from the marinade to a platter or baking dish, draining the excess marinade. Reserve one cup of the marinade. Spray your grill wok or wire rack well with canola oil spray then set it on your grill grate and let it preheat for 2-3 minutes. Grill the pork and veggies in the wok or on the rack direct for about four minutes per side. While grilling, bring the reserved cup of marinade to a gentle boil in a sauce pan over medium heat and let boil for five minutes. This kills the nasties in the marinade and allows you to use it as a finishing sauce. Remove the pork and veggies to a platter and drizzle with the cooked marinade. Garnish with the sesame seeds and chopped scallions. Awesome recipe, John! Do you think it would also work with skirt steak? Thanks. Yes, the marinade would be great for steak, or even chicken. The pork meat fire looks and sounds stunning. Awesome recipe! Used it on beef instead of pork last week. Even the kids really enjoyed it. They were spicy but not obnoxious.....tasted great! Thanks John! Great site...I'm a fan.